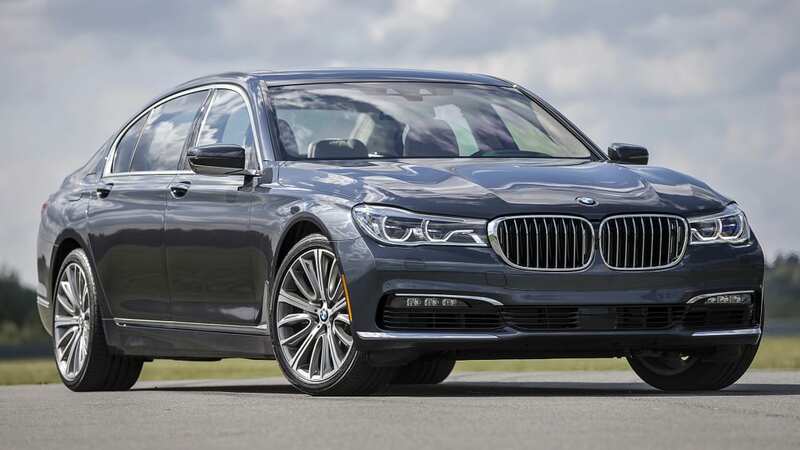 Autoblog rating for the BMW 750 is not available. Please check back later. Flagships demonstrate strength. "This is what we can do," these cars say with emphasis. 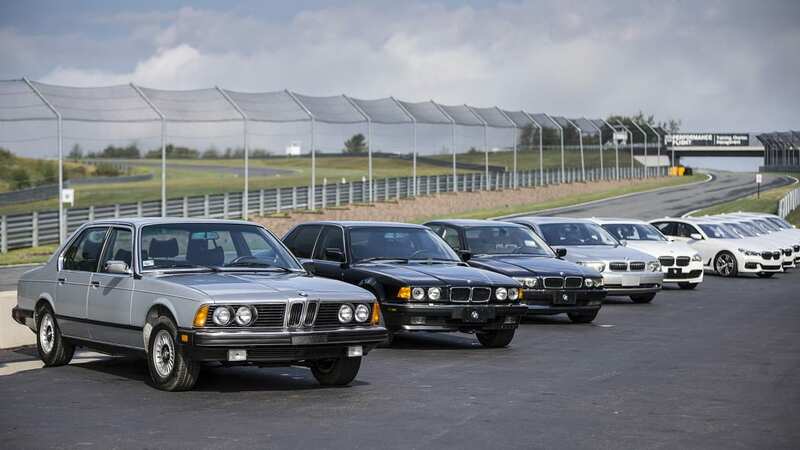 Since 1977, the 7 Series has been a rolling showcase of BMW's capability. 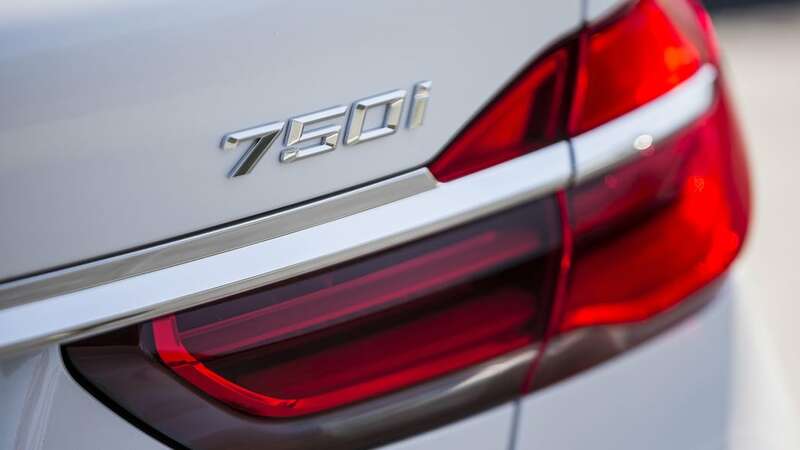 Sure, BMW makes racecars, but the mighty 7 is a proud reminder that the Roundel also stands for luxury. 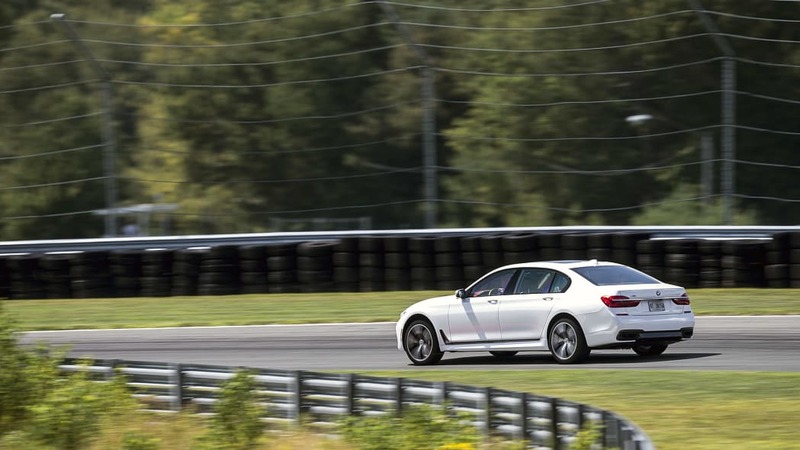 Except the 7 Series has been eclipsed by the Mercedes-Benz S-Class, a technological tour de force that Mercedes haughtily calls the industry's flagship. BMW makes a pretty nice car, but no one would dare call it that. Bimmer should probably just lower the flag, right? Not yet. Most of history's famous flagships have been fighting machines. They exude confidence, but also pack a punch. 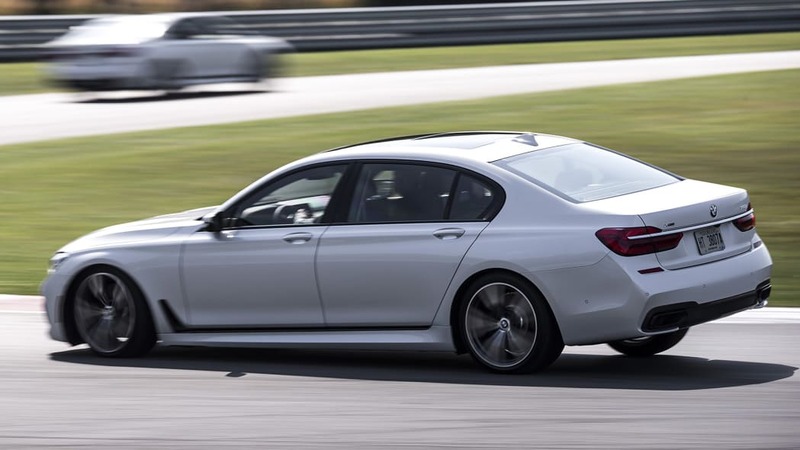 And with the 2016 7 Series, BMW is unleashing a broadside on Mercedes and the rest of the industry. 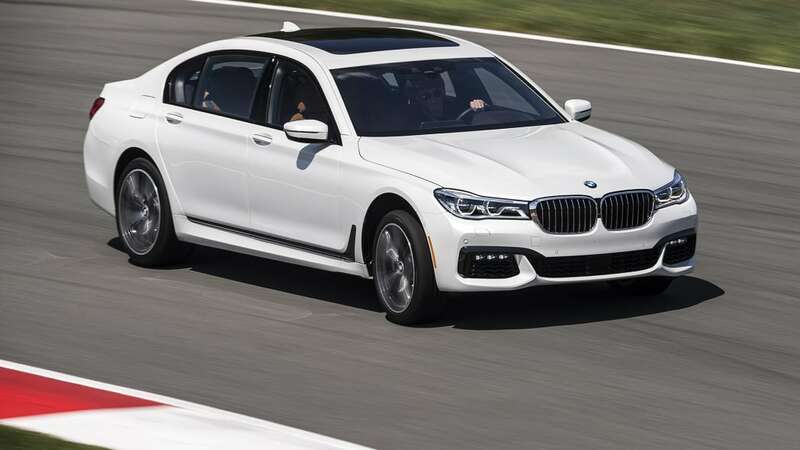 Rather than raw power, the sixth generation of the iconic 7 Series is loaded with sophisticated technology that makes the new sedan more luxurious and comfortable. 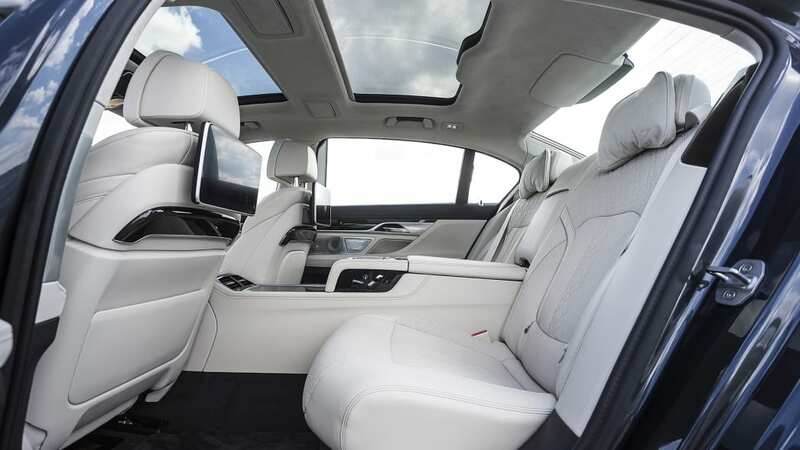 While it looks familiar from the outside, most of the improvements are in the cabin or under the skin. 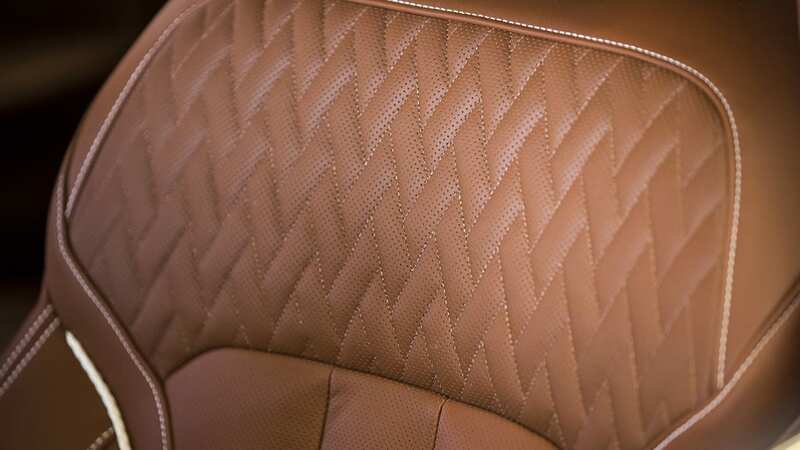 Things like the carbon fiber used for the passenger cell that help the 7 Series shed 190 pounds compared to its predecessor. Or the touchless gesture control that allows you to accept or decline phone calls with simple hand motions. 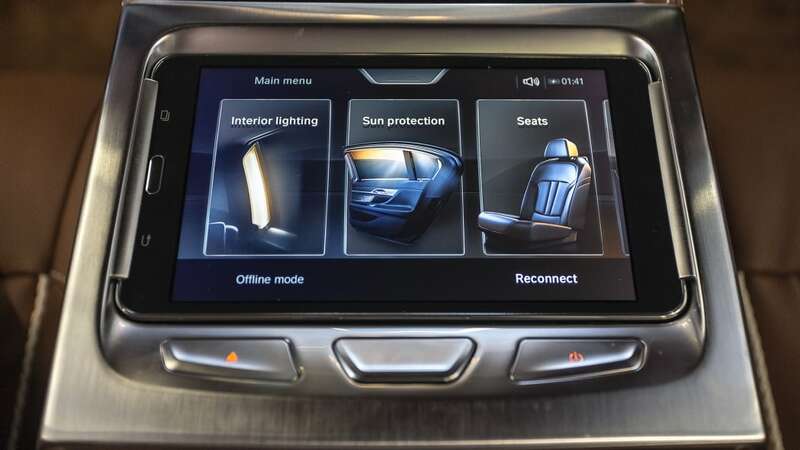 Even the infotainment system is better, with a pinch-to-zoom feature that makes iDrive less confusing and more like the user-friendly iPad. 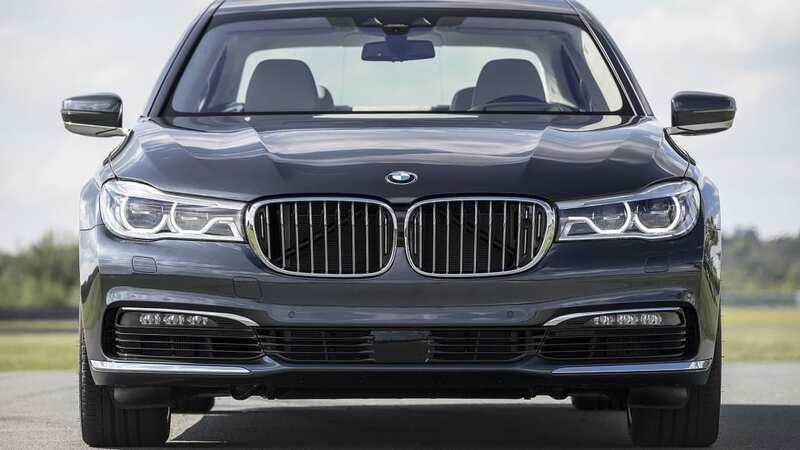 BMW is unleashing a broadside on Mercedes and the rest of the industry. 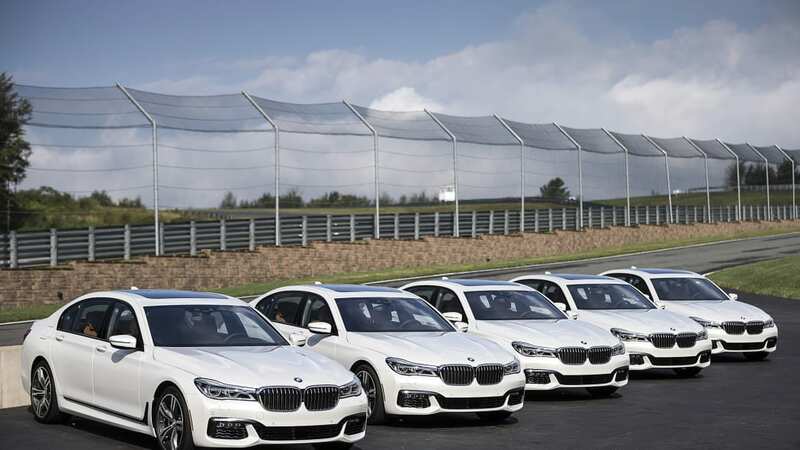 It's a lot of high tech stuff, but the driving experience is still the top priority for BMW. 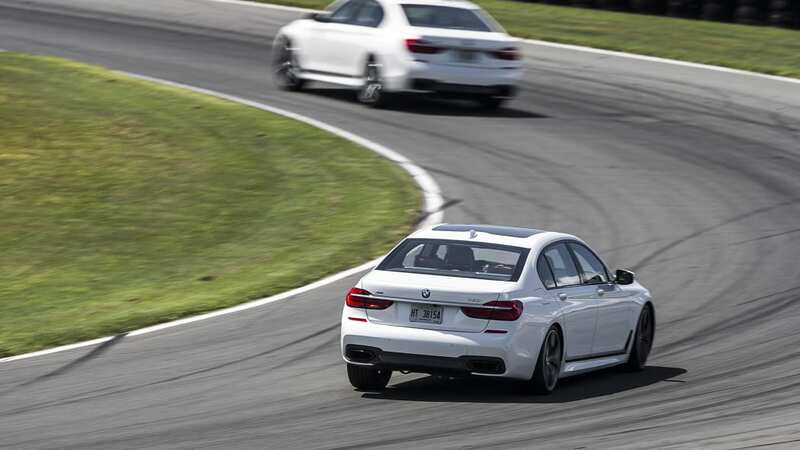 To test its mettle, we traveled to the Monticello Motor Club in rural New York. 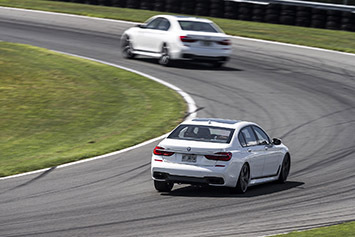 After several hot laps on the road course (more on that later) we slip behind the wheel of an Arctic Gray Metallic 750i xDrive for some public road driving. The big sedan immediately masks its size on the twisting rural state routes. With 445 twin-turbo V8 horsepower urging us forward, we barrel ahead as the countryside blurs by. Once we settle into a relaxed, legal pace and get our bearings inside the car, we check out some of the new tech. 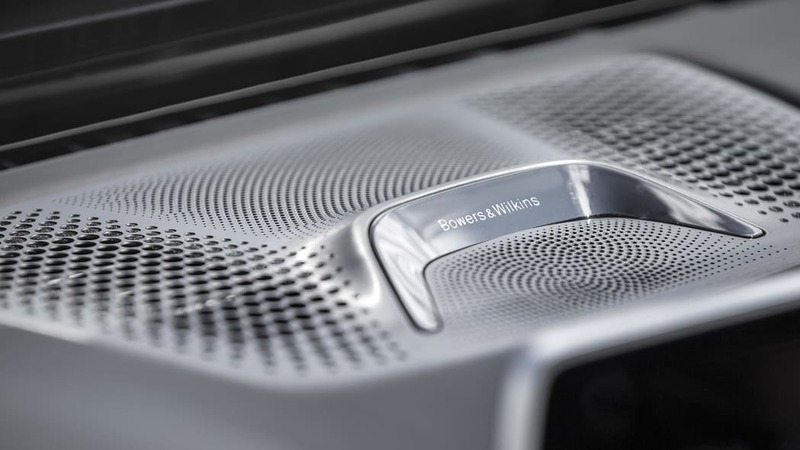 The gesture control is easy to activate while driving, and with a twirl of a finger we turn up the silky-sounding Bowers & Wilkins system. Gestures actually work as advertised. No one calls us, but during an earlier demonstration we were able to decline a call with a dismissive backhand. It felt good. 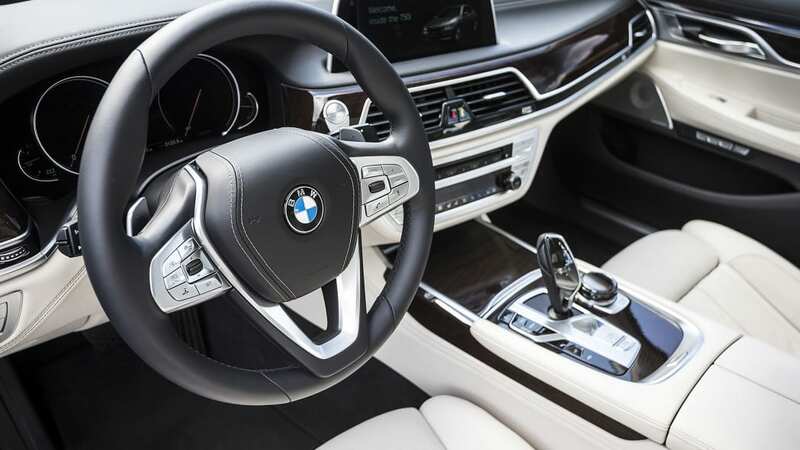 "Gesture control is one of those things that you when you have it, you wonder how you ever lived without it," BMW board member Ian Robertson said. Check it out, below. 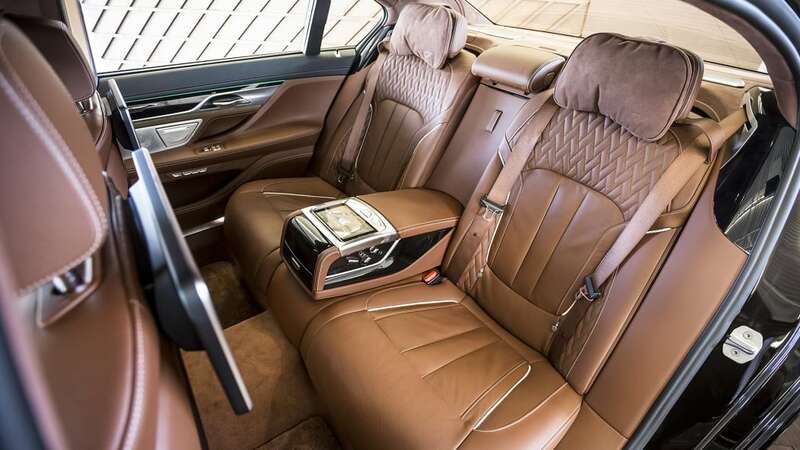 The new cabin is nicer and more modern than the fifth-generation 7 Series. 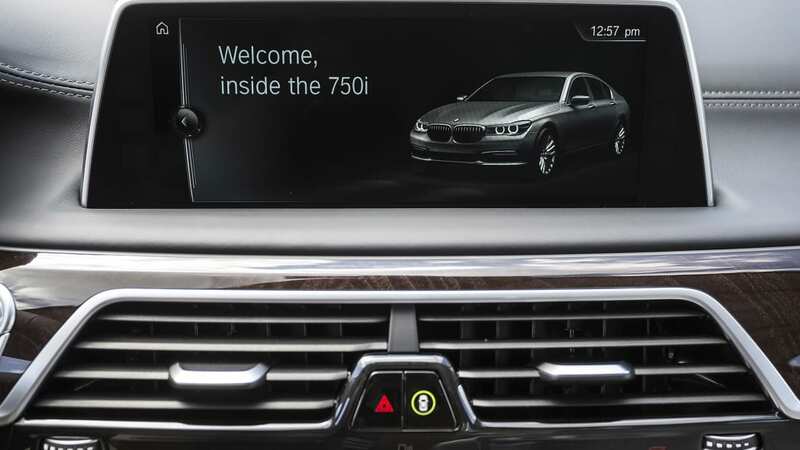 In an unfamiliar car driving on unknown roads, the new head-up display is a boon to minimizing driver distraction. The HUD has a 75-percent larger projection area and offers helpful information like current speed, the posted speed limit, and navigation information. 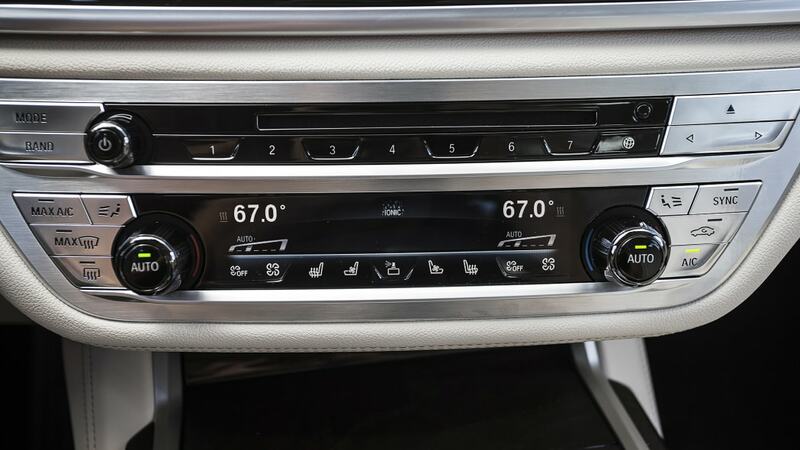 Glowing dials sit below the HUD in the instrument panel, shown on a 12.3-inch display that changes colors and layout depending on the driving mode selected. In Sport, the primary hue is red. It's blue for Eco, and Comfort has soothing white readouts. 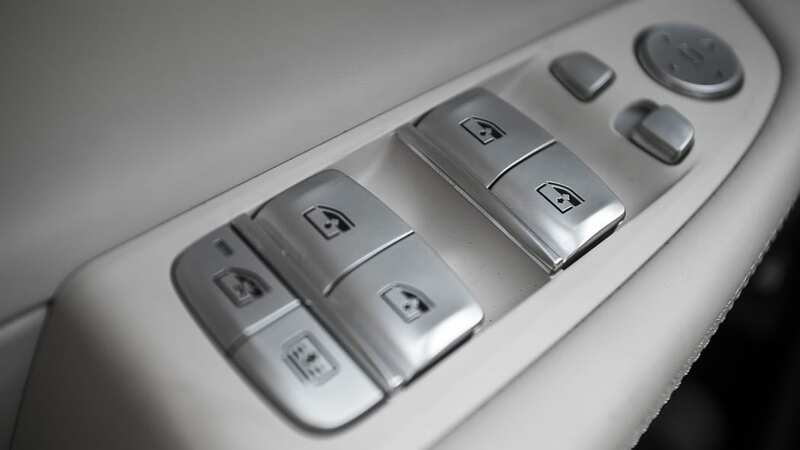 But BMW has not forgotten traditional haptic details like buttons. Yep, they're still here, in large quantity for things like working the vents and radio. These touchpoints are now galvanized with a thin layer of metal for better feel and snazzier looks. 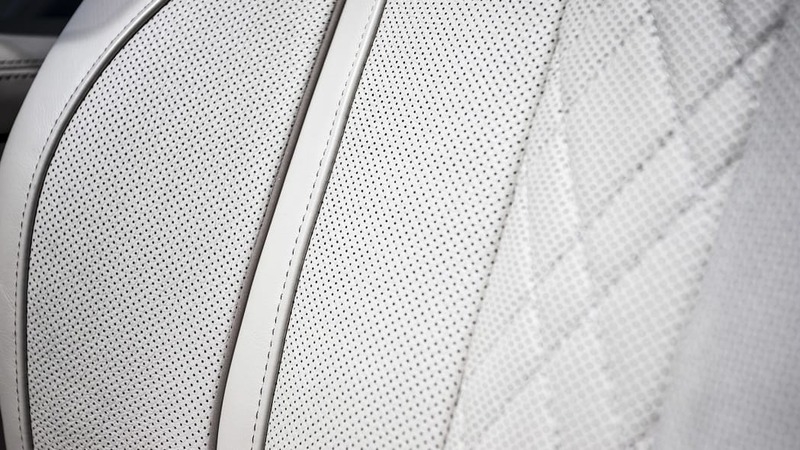 "The details, this obsession with detail in the interior, was essential for us from the start," said Karim Habib, head of BMW design. 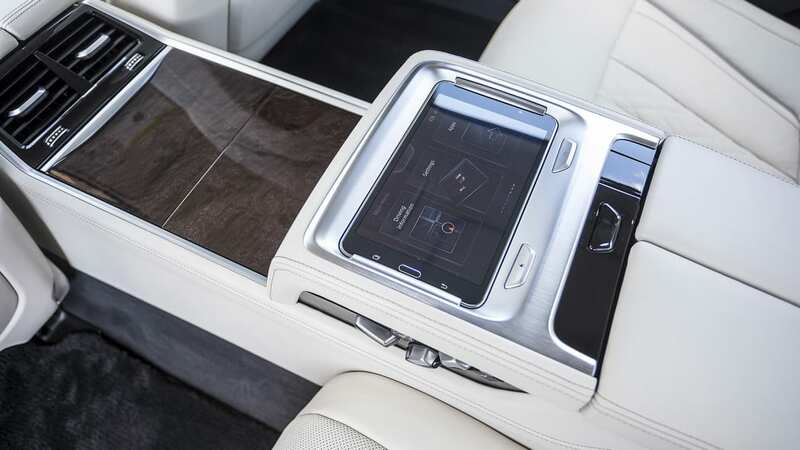 The obsession paid off, and the new cabin feels like it's at the forefront of modern design compared to the one in the aged fifth-generation 7 Series. Our test car is done up in ivory white and black. 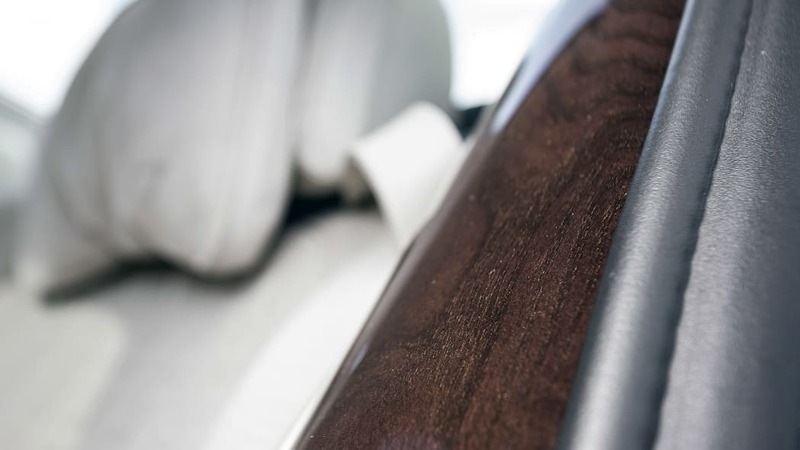 Wood and gray metal trim bisect the dashboard and the cabin. The black sport steering wheel is accented with gray stitching. 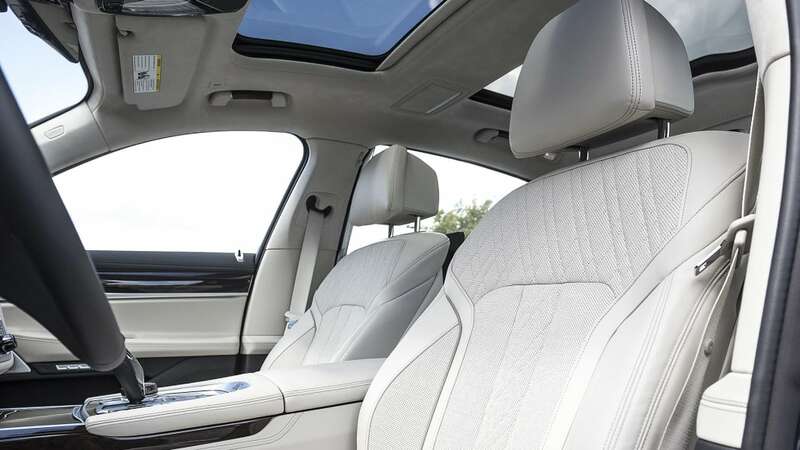 The seats look and feel creamy, and we rest our noggin against the soft headrest when traffic slows. 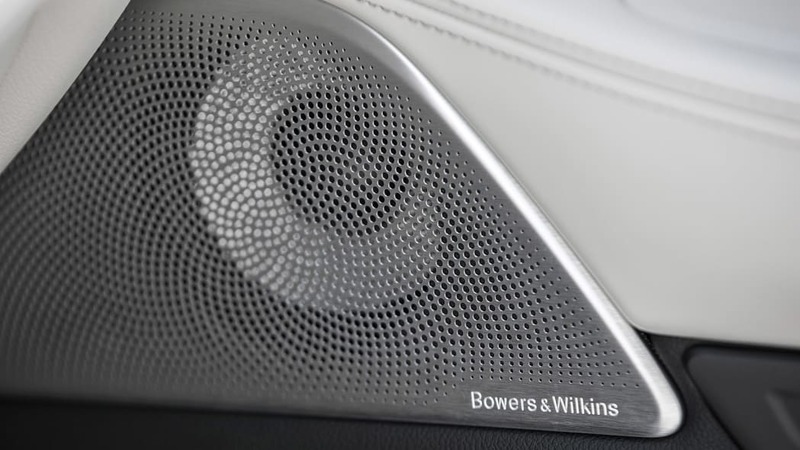 Our car has an optional ambient air feature, which can dispense fragrance or ionize the cabin. 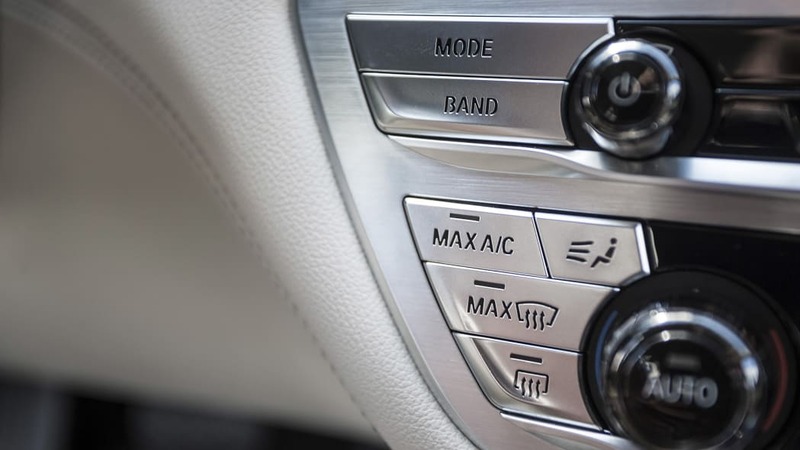 We choose a manly scent, punch up the cooled seats, crank the air, and flick on the seat massager to blunt the severity of this hot summer day. 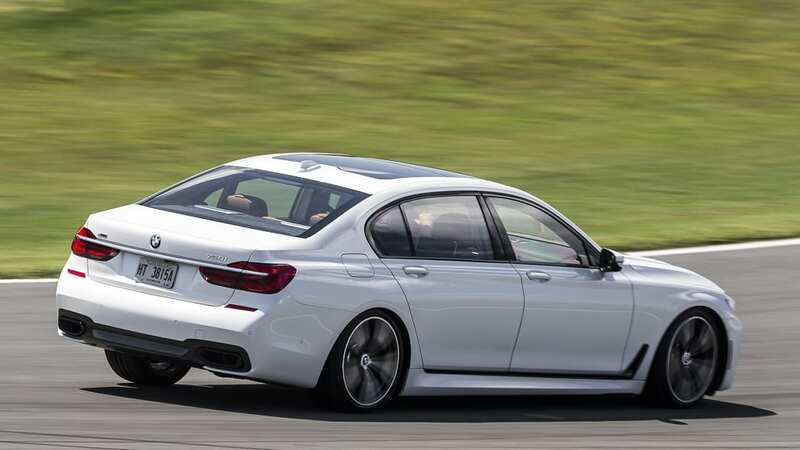 The new car is more than an inch longer than its predecessor and only comes in long-wheelbase form in the United States. Behind us, the back seat is equally opulent. 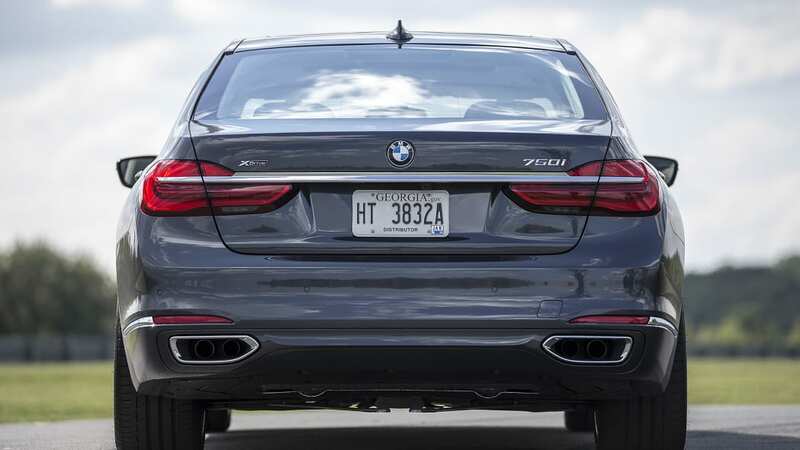 The new car is more than an inch longer than its predecessor and only comes in long-wheelbase form in the United States (Europe and other markets will offer a shorter version). 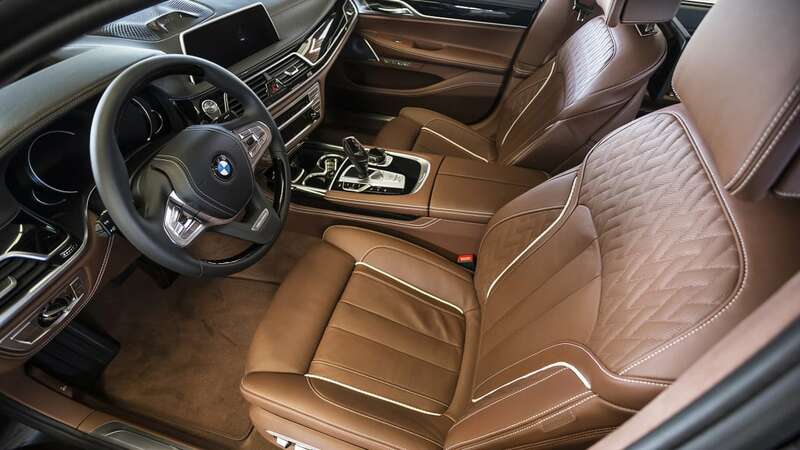 This test model has the rear executive lounge package, which adds reclining heated and cooled seats, footrests, a fold-out table, and two 10-inch screens controlled via a seven-inch touchscreen command tablet. 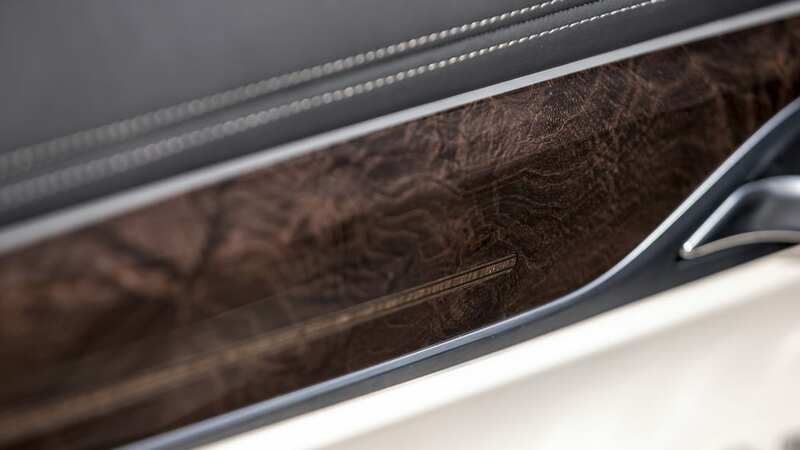 And though you won't notice it when seated, the wood accent at the base of the C-pillar might catch your eye – or that of a discerning executive – as he or she gets into the back. The optional panoramic Sky Lounge LED roof promises to be more striking, and the lights are said to create what looks like a star-lit canopy at night. In the 7 Series, you get your own galaxy, but the astral surroundings don't distract from another reality: this car is fun to drive. 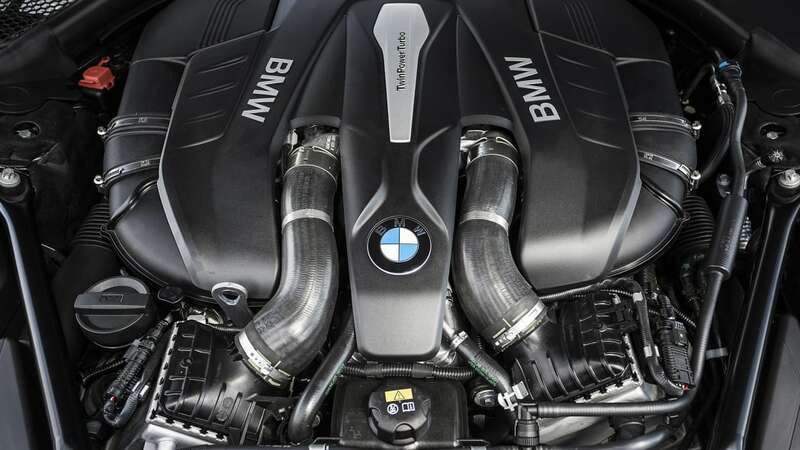 Not in the same manner as the 3 Series, obviously, but it's hard not to like a beefy V8 sending big time power and 480 pound-feet of torque to all four wheels. 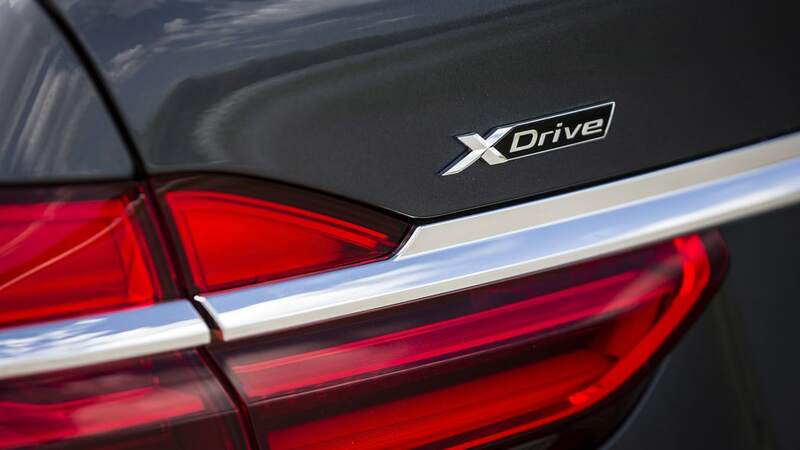 The 750i xDrive can hit 60 miles per hour in 4.3 seconds, which is half a second quicker than the Mercedes S550 4Matic based on manufacturer claims. Flashing back to our laps at Monticello, we're still smiling from the exhilaration. 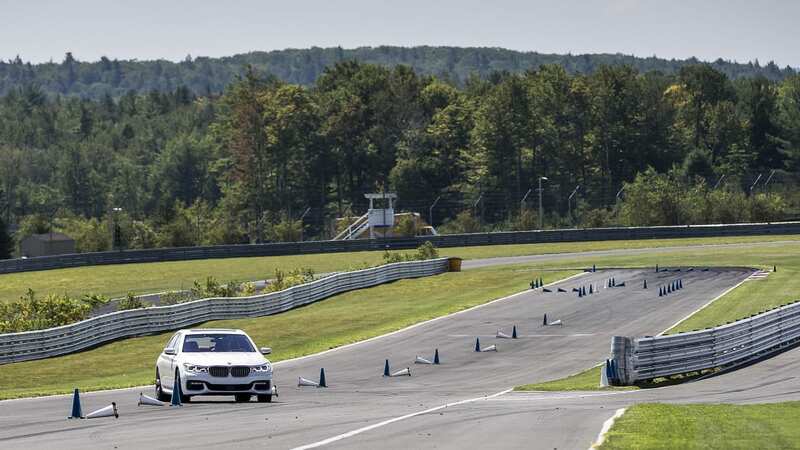 Yes, you can lap Monticello in a 7 Series if you want to. We switch into Sport mode, steady our nerves, and follow in the wake of Bill Auberlen, who drives a BMW Z4 in the Tudor United SportsCar Championship. 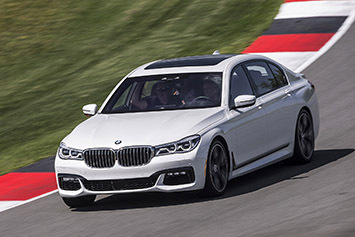 Screeching and sliding as we push it around the track, the 7 Series handles well, and not just for a car that weighs 4,610 pounds. It handles well, and not just for a car that weighs 4,610 pounds. 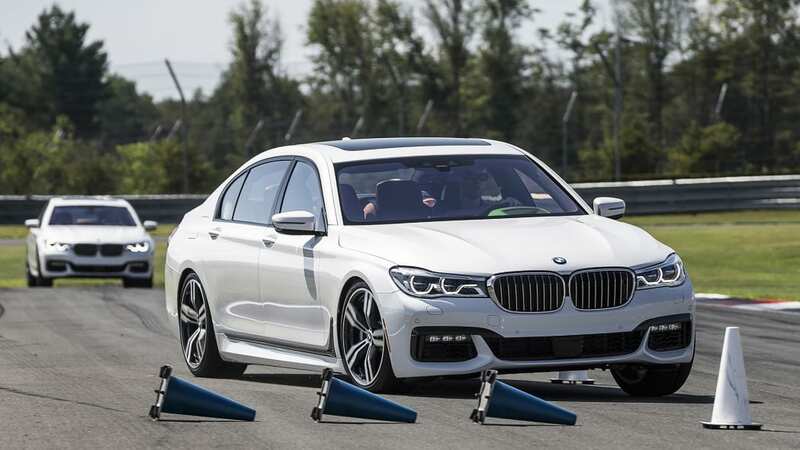 BMW added four-wheel steering to the xDrive-equipped 7 Series for the first time, and it helps the car feel stable and confident at high speeds. Conversely, slow-speed maneuverability also improves. 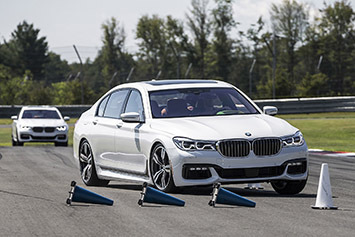 Wheeling around the track means there are no parking lots in our immediate future to check the steering's ability in tight spaces. But our laps at Monticello exhibit the V8's strength, the eight-speed transmission's smoothness, and the adaptability of the chassis. 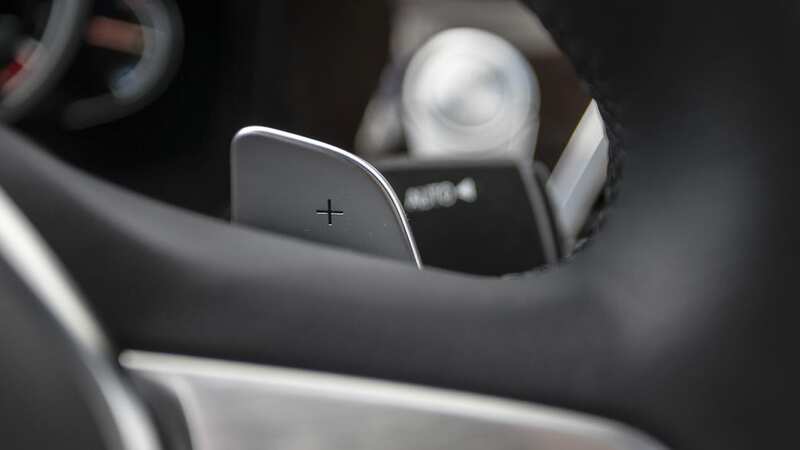 The electric power-assisted steering offers the right feel in corners and communicates smartly. 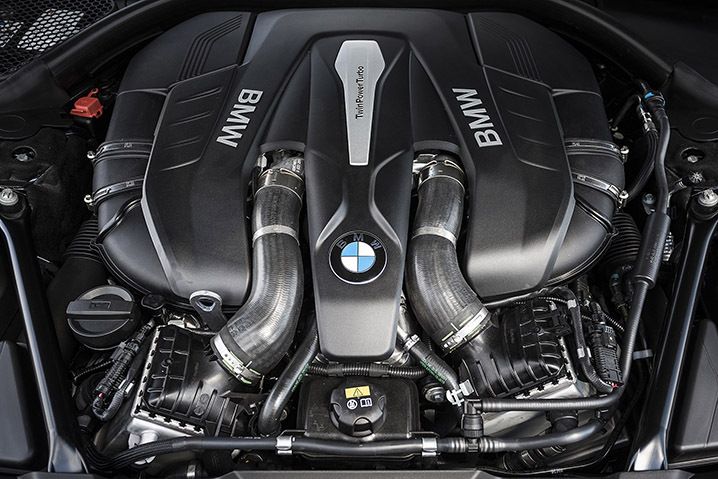 For now, US customers get the 4.4-liter V8 or a turbocharged, 3.0-liter inline-six that makes 320 hp and 330 lb-ft. 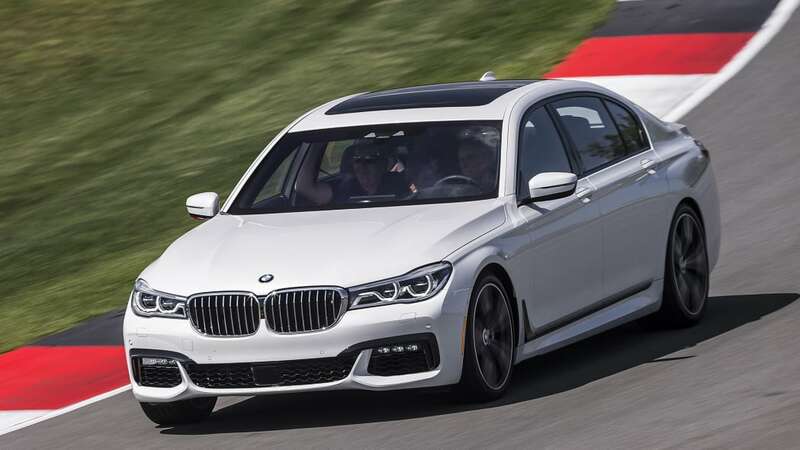 This new 7 Series doesn't offer a V12 like the old one did, though there's a new plug-in hybrid variant coming next year that pairs a four-cylinder engine with a lithium-ion battery pack. Total electric range is 23 miles. 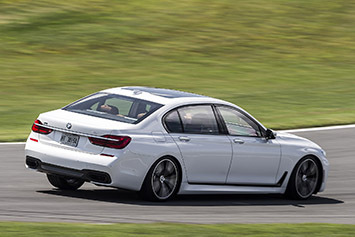 While BMW's flagship passes our tests at a variety of speeds, it flunks one situation: in park. We stop to take pictures, and the car locks itself while we're outside. 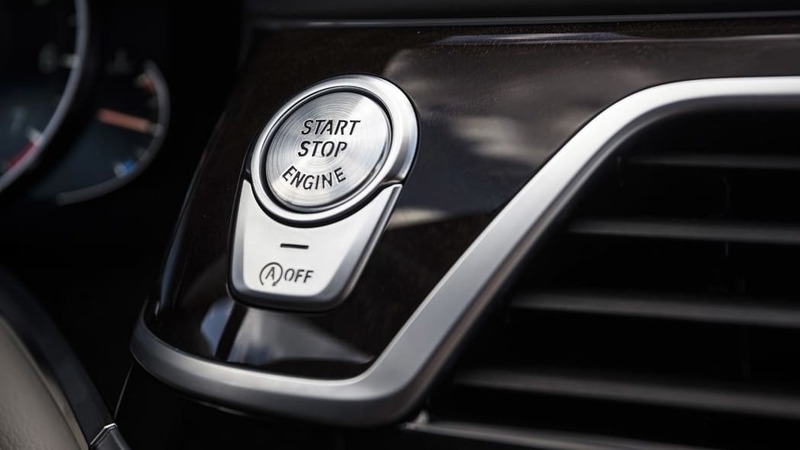 We leave the new LCD touchscreen keyfob in the center console, which isn't smart, but a BMW engineer assures us it shouldn't lock up, and couldn't explain why it did. After a brief delay, the car is unlocked remotely and we're on our way. 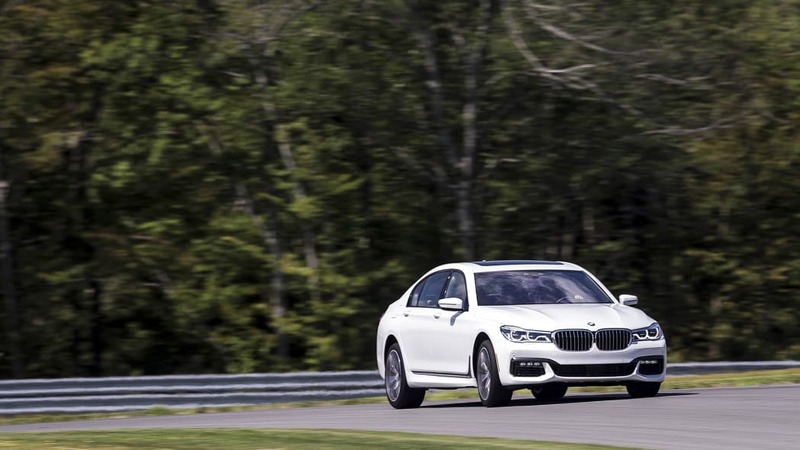 BMW needs to show more of its cards to truly close the gap with Mercedes. During that interlude, we absorb the 7er's fresh design. It doesn't look that much different, but Habib and his team dressed up the styling to make the car more tastefully modern. The fifth-gen car arrived int he US in 2009 was beginning to look a dated. 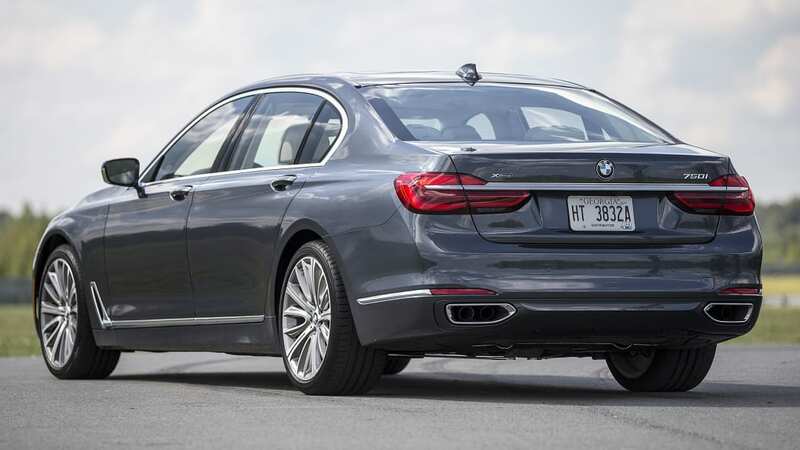 The new version still looks like a 7 Series, but the details are busier. Like the chrome hockey stick-shaped element stretching from the vents in the front fender all the way through the rear door. The creased hood and piercing LED lights make the front end appear more pointed than before. 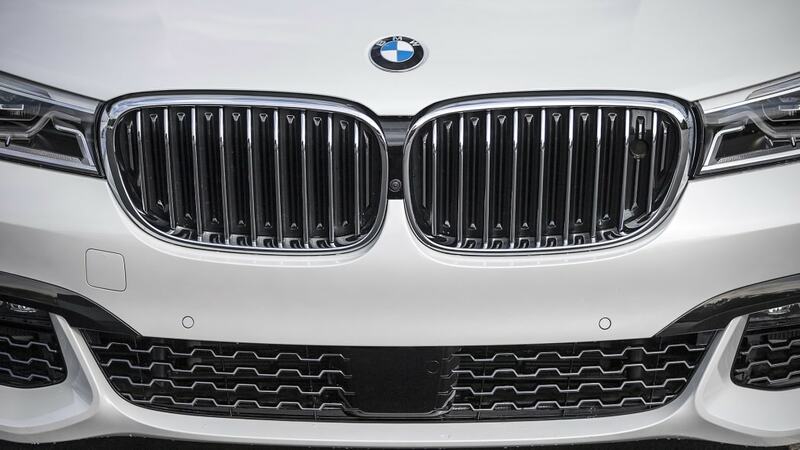 A flap now hides behind the kidney grille to feed extra air to the radiator when the engine requires more cooling. Otherwise, it remains closed to aid aerodynamics. The body forms are moved around, and the door handles blend into the top character line. The appearance is more attention-getting, but not overdone. 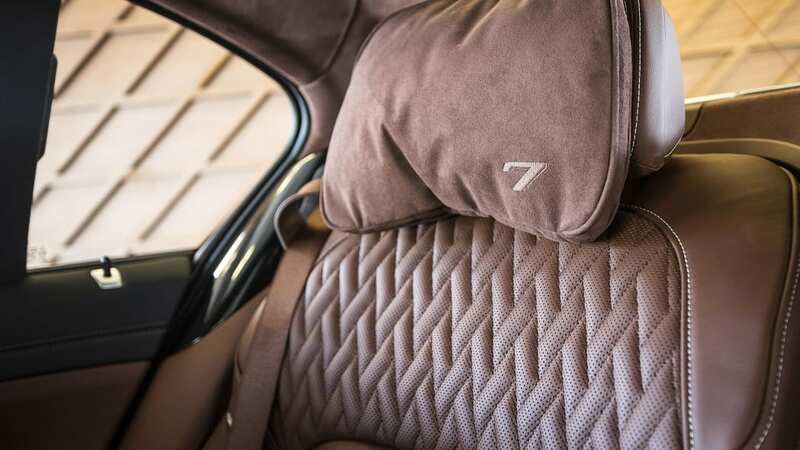 Launching in showrooms this October, the new 7 Series is refashioned with more features that make life better and more luxurious. 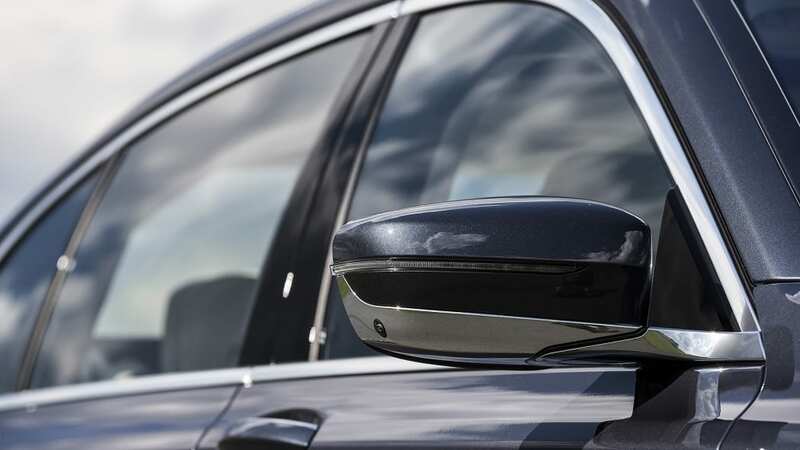 They're sophisticated upgrades – things that passengers will like once they're inside, but won't notice from the curb. 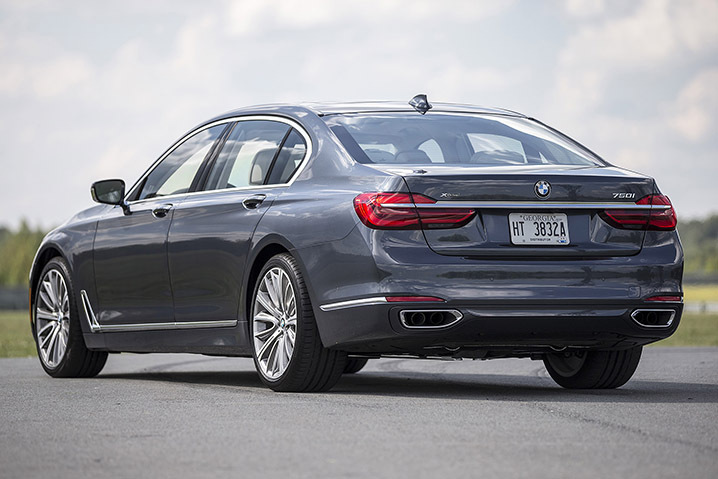 Our gut says the Mercedes S-Class still feels more decadent, and BMW needs to show more of its cards (like more powertrains) to truly close the gap. 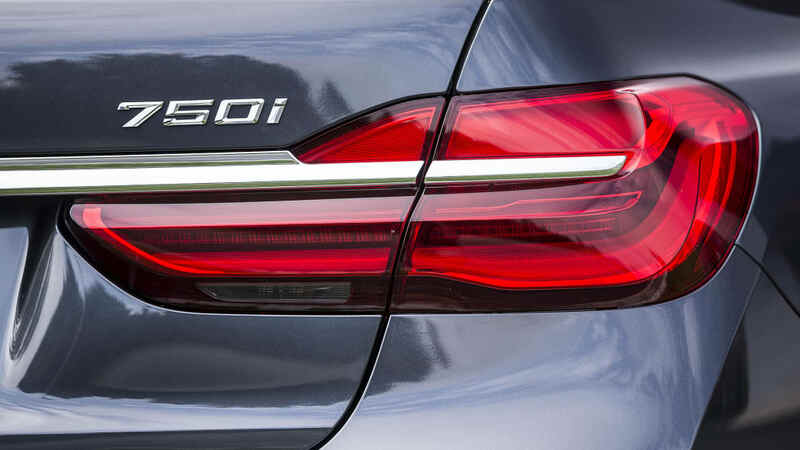 But based on our early impression the so-called industry flagship once again has a formidable challenger from Bavaria.